What would cause someone’s phone to explode at 7:00 in the morning? Heather Hoffmann can provide one possible answer. That is what can happen if the Rochester Democrat and Chronicle gives your restaurant its award for the #1 Fish Fry in the Rochester area. And that’s exactly what happened to Crabby Dan’s Grill on March 6. The Mendon-Honeoye Falls-Lima Sentinel is the official newspaper for the three towns comprising the southern swath of Monroe County; namely Wheatland, Rush, and Mendon, going from west to east. Venturing into Livingston County, we’re also the official paper of Lima. While we’re very prideful of our home turf in general, we can’t help but exalt in the fact that one of our local establishments has received such a prestigious award. When the “We’re #1” article hit the newsstands that morning, the impact was immediate. It was a Friday and when Crabby Dan’s lunch menu opened up at 11:00 am the fish were flying out of the place. By 5:30 they were sold out. Fortunately their vast menu affords many other options and steps have been taken to keep up with the increased demand. We asked Heather how many fish fries she’s serving these days and that tally would be about 400 fish fries per night. In case you’re wondering, that boils down to about 280 pounds of fish. Holy mackerel! What manifestations have developed from this fish fry frenzy? 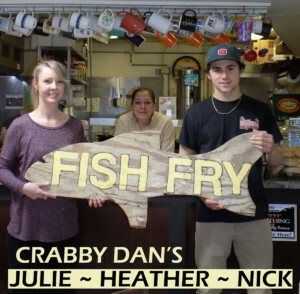 Crabby Dan’s has purchased a new supersized fryer to accommodate the demand and the fish fry frequency has now doubled to Wednesday and Friday. Heather’s staff is sharing the excitement of the Crabby Dan’s success. There was a committed crew on hand when we visited last Wednesday after the lunch crowd had thinned out. Her assistant chef is her son Nick Guggino who is a senior at Bloomfield and has worked at the restaurant all through high school. Heather’s royal highness of hospitality is “customer service engineer” Julie Elardo who’s been onboard now for three years. If you live near Mendon and have taken Crabby Dan’s for granted too long, please allow this to be your wake up call. Here are the logistics you need to know. Crabby Dan’s is located just north of the four corners of Mendon in the Mendon Village Commons at 1350 Pittsford-Mendon Road. The hours are 6:00 am to 1:30 pm on Monday and Tuesday, 6:00 am to 7:30 pm Wednesday through Friday, and Saturday from 7:00 am to 11:30 am. As any local readers who have visited Crabby Dan’s will know, it is a quaint family-friendly establishment where you can seat yourself all on your own, no hostess required. Upon staking out your spot, just proceed to the counter and place your order as you watch the cooks working hard in the open kitchen in the background. At this point the aromas alone are absolutely enticing! When things get busy, the staff can expand to as many as eight people to make sure everybody is comfortably accommodated whether you are eating in or taking out. Heather took over this business in November of 1998 so she celebrated her 20th anniversary last fall. If Crabby Dan’s continues to thrive at its current pace it’s hard to project where Heather will be 20 years from now. Hopefully the answer to that will be healthy and here in the hamlet. We throw in that “healthy” comment because Heather has one unique tenet in her restaurateur approach. She is the only person in the world who knows the secret recipe for the #1 fish fry and she’s vowed to take it to the grave with her!